Improve your public speaking skills! Nothing will improve your presentation skills more than straight up practice. Engaging in public speaking opportunities whenever you can will give you increased command over your delivery. This helps minimize any anxiety you might have—and those are just a couple of the benefits of regular practice. A Toastmasters Club is a non-profit organization designed to help individuals become better communicators through leadership training and public speaking practice. There are over 15,900+ clubs in over 142 countries, so there’s bound to be one within your vicinity, no matter where you are. Joining a Toastmasters Club is an invaluable opportunity to practice your public speaking skills regularly in a safe, supportive environment. And when we say invaluable, we mean it. Below are just five of the many reasons why you should join a Toastmasters Club today. Nothing crushes fear more than confronting it head-on. One of the biggest advantages of joining a Toastmasters Club is that it can significantly reduce any fears around public speaking. You can ultimately eliminate them altogether by allowing you to present repeatedly. After a few meetings, speaking will feel much less anxiety-inducing and much more like second nature. Confidence is critical to giving a killer presentation. Without it, you’ll not only make your audience uncomfortable by appearing nervous and unsettled. You won’t be able to focus on an excellent delivery. Attending Toastmasters meetings and rehearsing your presentation skills frequently will give you more confidence in your abilities as you learn just how capable you are. Whether you’re a CEO of a major company or you’re an entry-level intern, leadership skills are paramount to elevating your career. In addition to helping you lead more confidently and fearlessly, Toastmasters also allows presenters to take on various leadership roles within the organization so that you can practice leading your club in a low-stakes environment. No matter how thoroughly you rehearse, it’s nearly inevitable that you’ll stumble upon at least one question, comment or topic from the audience that you weren’t ready for. Giving repeated presentations will increase your ability to think on your feet. If an audience member throws a question out of left field, you can smoothly and confidently talk your way through it. Toastmasters has 345,000+ members worldwide and it’s dominated by intelligent, educated people looking to improve themselves and advance their careers. That means that you’ll be exposed to a diverse group of people eager to share insights. You will make connections to expand your network of helpful people and resources. Dare to be different and Do something! Joyful Public Speaking; Our Journey from fear to Joy! 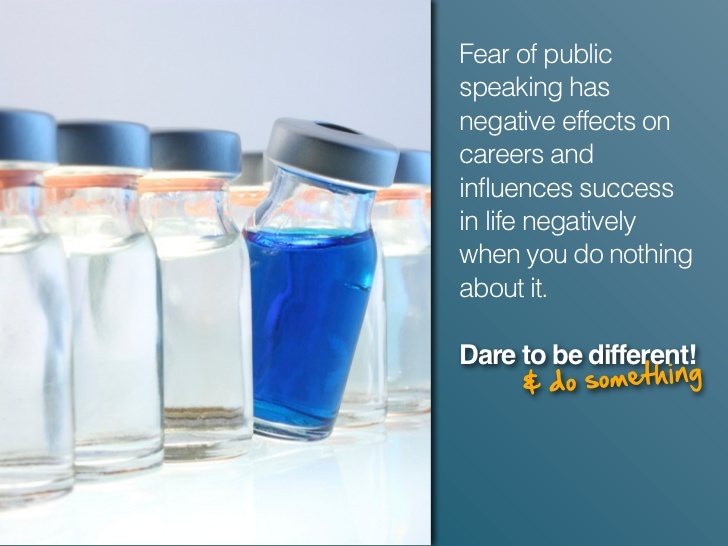 Do you want to overcome your fear of Public Speaking?